The Health Careers Program is excited by the start of a new and inventive initiative designed to increase the health information literacy levels of high school students. In collaboration with the National Library of Medicine, MUSC Library, Colleton County High, North Charleston High, and Lowcountry Leadership schools, the South Carolina AHEC is facilitating a dynamic and creative service learning opportunity for high school students. The project provides the high school participants with an exposure to population health issues while developing valuable personal skills. As an additional outcome, the participants will create a series of enduring, educational comic books that introduce younger students to health careers. Funding for the project is provided through a grant from the National Library of Medicine (NLM). The Centers for Disease Control and Prevention recognizes the value of classroom instruction of functional health information and the development of skills necessary to adopt and maintain health through health-promoting behaviors. Experiential education offers a process long regarded as an effective method of instilling knowledge, skills, and enthusiasm simultaneously. These types of educational offerings also help to facilitate a manageable and supervised progression from one level of an educational pipeline to the next. Four student-led teams will use NLM resources to research a public health topic and the health professions associated with that topic. The teams will interview health professionals and complete an investigative report on healthcare delivery settings. The teams will use the reports will to create storyboards for the production of comic books. The comic books will guide a young reader’s exploration of the public health topic and the inter-professional involvement of healthcare workers. School-based liaisons will work with AHEC and MUSC Library staff to deliver training and support for the identification and use of NLM and other resources to promote the improved health literacy of the participants. To find out more about the project, contact Angelica Christie at christae@musc.edu. 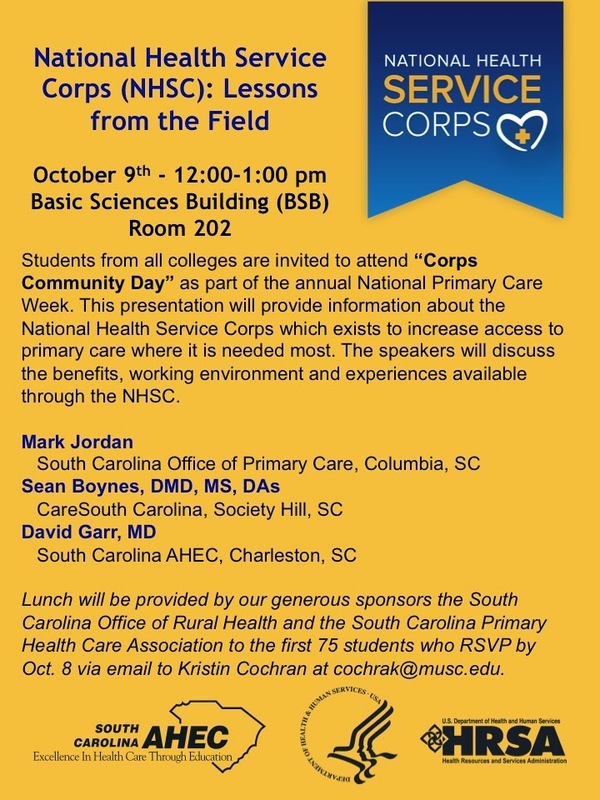 On October 9, health professions students from across the state are invited to attend South Carolina’s recognition of “Corps Community Day” as part of the annual National Primary Care Week. This program will provide information about the National Health Service Corps (NHSC), which exists to increase access to primary care where it is needed most. The NHSC is a federal program that provides scholarships or repays the educational loans of health care providers who agree to serve a minimum of two years in a federally designated health professional shortage area. Mark Jordan, Director of the South Carolina Office of Primary Care, will provide an overview of the NHSC including scholarship and loan repayment opportunities. Sean Boynes, DMD, and David Garr, MD, will discuss the benefits, working environment, and experiences available through the NHSC. The South Carolina AHEC, the South Carolina Office of Rural Health and the South Carolina Primary Health Care Association are sponsoring the program. The event will take place at MUSC in Room 202 of the Basic Science Building, and lunch will be provided to registered attendees. Students from USC, USC School of Medicine - Greenville, and the Virginia College of Osteopathic Medicine - Carolinas Campus are invited to participate via videoconference. Progress on Lowcountry AHEC’s new building is progressing, with walls and a roof already added after the groundbreaking this summer. 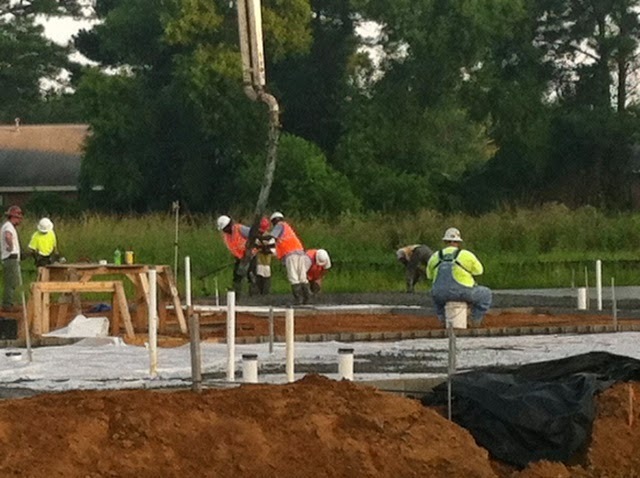 The Colletonian featured Lowcountry AHEC in an article that can be found in its entirety on their website. The new building is expected to open in March 2015. The South Carolina AHEC Program Office welcomed a new addition to the team earlier this year when Ben Gilbertson joined as Computer Programmer. Ben is working closely with Steve Boulanger on expansions, improvements, and revisions to a number of South Carolina AHEC data systems and websites. Ben's background includes over a decade of programming and web development experience, primarily in an educational context at the Medical University of South Carolina. In his free time, you might find Ben sailing competitively, traveling, or building and repairing things in his garage workshop. Ben also has an interest in physics (and a master's degree in physics/materials science). Ben is an excellent addition to the AHEC team and the Program Office is very happy to have him on board. Ben can be reached via email at gilbert@musc.edu. Mid-Carolina AHEC and The South Carolina HIV, STD, and Viral Hepatitis Conference Committee have partnered once again to host the “2014 SC HIV, STD, and Viral Hepatitis Conference” scheduled for October 28-30. The conference will be held at the Columbia Metropolitan Convention Center in Columbia, SC. This interdisciplinary conference is designed for nurse practitioners, physician assistants, nurses, other clinicians, HIV/STD/Viral Hepatitis educators, social workers, case managers, public health professionals, other service providers, teachers, students, people living with HIV/AIDS and other interested community members. The overall mission is to provide opportunities for professionals and community members to engage in dialogue related to current practices, interventions, and emerging concerns and trends. A preconference institute will take place on October 28. This Pre-Conference Institute is sponsored by the SC DHEC/HIV Division’s Ryan White and AIDS Drug Assistance Programs, the SC HIV Planning Council, its Positive Advocacy Committee and Needs Assessment Committee and the SC HIV, STD, and Viral Hepatitis Conference. Upstate AHEC will sponsor “Therapeutic Interventions for Patients with Cardiovascular Disease” on December 4-5. This two-day course will provide a comprehensive overview of the therapeutic management of patients with cardiovascular disease, especially as it pertains to the fields of physical therapy and occupational therapy. This program will review the physiology and pathophysiology of the cardiovascular system and exercise physiology concepts. 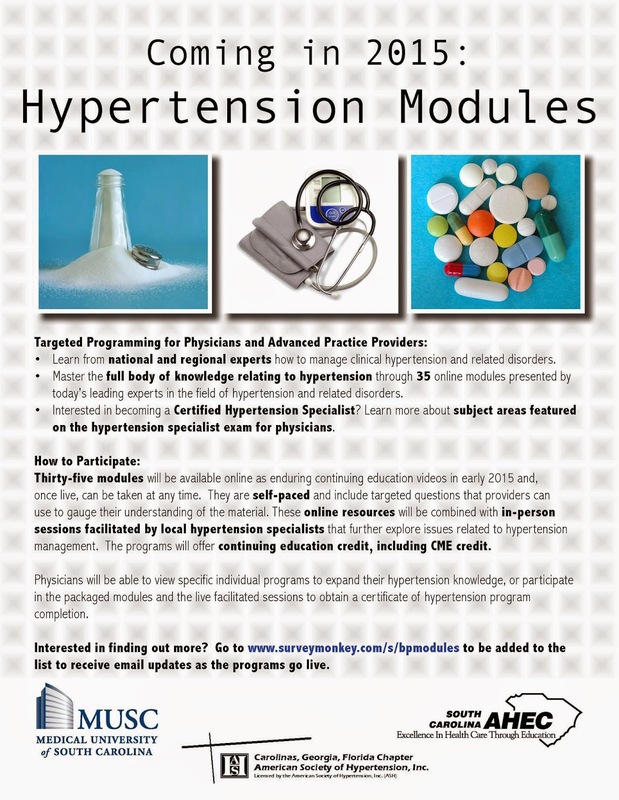 Instruction will focus on the management of patients with coronary artery disease, hypertension, congestive heart failure, valvular heart disease, pacemakers, peripheral arterial disease, venous disease, and pulmonary embolism. Evidence-based information on a variety of therapeutic approaches will be discussed to provide a foundation from which appropriate decisions can be made with regard to patient needs. The instructor Ethel Frese, PT, DPT, MHS, CCS, is an associate professor in the Doisy College of Health Science at Saint Louis University and an adjunct instructor in the physical therapy program of Washington University School of Medicine. Dr. Frese is a board certified specialist in cardiovascular and pulmonary physical therapy and she is currently the president of the Cardiovascular and Pulmonary Section of the American Physical Therapy Association. 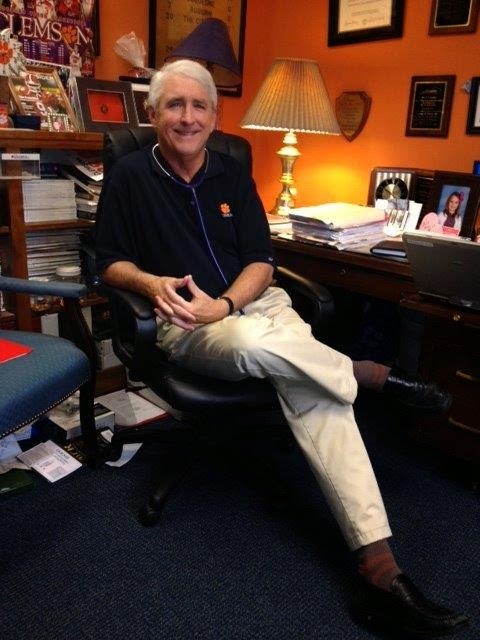 Dr. Frese is a nationally recognized speaker and presents lectures and courses on cardiovascular and pulmonary physical therapy throughout the USA. The target audience includes physical therapists, physical therapist assistants, occupational therapists, and certified occupational therapy assistants with a basic to intermediate level of experience. The course will be hosted by AnMed Health in their Healthy Futures Trust Room on the AnMed Health North Campus in Anderson, SC. For more information please visit the Upstate AHEC Website www.upstateahec.org or call Bennie Pettit at 864-349-1162. Long Term Care Facilities may be defined as institutions that provide healthcare to people who are unable to manage independently in the community. More than 1.5 million residents reside in United States’ nursing homes. In recent years, the acuity of illness of nursing home residents has increased. It is not surprising that almost as many healthcare acquired infections occur in Long Term Care Facilities as in hospitals in the United States. On October 28, Pee Dee AHEC will host a three-hour course that addresses infection prevention in long term care settings in Florence, SC. This standardized program was developed through funding provided by a partnership with the Centers for Medicaid and Medicare and the North Carolina Division of Health Services. Vicky R. Zelenka, RN, CIC, LNC, board certified infection preventionist and legal nurse consultant will provide instruction. She has 42 years of infection prevention experience, 37 of which she served in the acute care setting. She is a quality auditor for APIC (Association for Professionals in Infection Control and Epidemiology) Consulting Services in Washington, DC as well as a contributing author in infectious disease texts. Upstate AHEC will collaborate with the Upstate Healthcare Coalition to sponsor a one day conference entitled, “Improving Mass Fatality Management in the Upstate: How Do We Work Together?” on March 13, 2015 at the Hilton Greenville to a target audience of disaster response professionals within the Upstate Region of South Carolina. The goal of the symposium is to educate emergency response providers on the available resources and responsibilities of numerous disaster response agencies and community partners. Often in the event of major disasters, various response agencies are not fully informed as to each piece of the disaster response umbrella. This symposium will serve as an information exchange outlet in order to create a more thorough response system and a more unified regional disaster response team. The need for training is paramount in the field of disaster response. Keeping all responding partners up to date regarding the latest services and resources is critical for effective and comprehensive response to the community, during both manmade and natural disasters. Including representatives from all response partners, this symposium will be a critical component to information and resource sharing. As a result of this symposium, partner agencies will be knowledgeable regarding each of the response agencies that exist in each upstate county, as well as how to access services in a timely and effective manner. Attendees will also leave the symposium with an understanding of how all pieces of this puzzle fit together and will share information learned with their home agencies. This will increase the collaboration and effective use of services for the region. To learn more about the symposium, please contact Bennie Pettit at bpettit@upstateahec.org.